In celebrating the King of Thailand's 84th birthday, or more auspiciously known as the 7th Cycle Birthday Anniversary, on 5 December 2011, it is definitely quite difficult making a commemorative page for a beloved King of Thailand, especially one who has ruled the longest in the world. 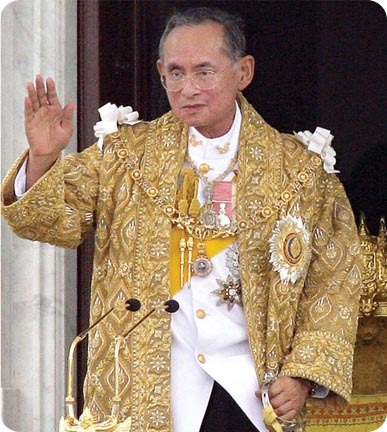 His Majesty King Bhumibol Adulyadej of Thailand has now ruled his kingdom for 65 years, in this his 84th year. Simply put, His Majesty has done so much for his country and his people. He has been through thick and thin, seen too many changes, both in his own kingdom and around the world. He is now on his 28th prime minister of Thailand, the first female one, as well as being the youngest at 44 years old. I would thus like to make this commemorative page like a simple scrapbook of my words and my favourite pictures of the king. The King smiles in both photos!....as well as in the one below. The picture on the left is a quiet and peaceful one of the king. His Majesty was ordained as a monk in 1953, at Wat Bavorn Nives Viharn, the Royal Temple established by His Majesty King Rama IV. 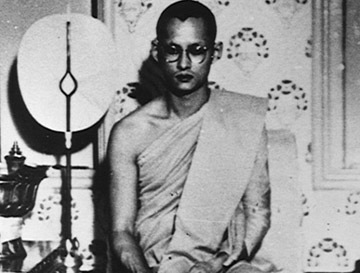 He took great comfort in the teachings of the Lord Buddha. It was said that whenever the King needed some private time to reflect on his life and kingship, he would quietly return to the temple to converse with His Holiness Somdetch Pra Nyanasamvara the Supreme Patriarch. I do wonder sometimes of the mocking photos of the king, made by both Thai and foreigners, or the bad articles written about him - what has the king done to these people that they see it necessary to produce such harsh comments? I am more glad though that many more look at what he has done for his kingdom and people over the past 65 years as king. I don't want to call them achievements, because I don't think the king views them as such either. How many people in the world has given their lives completely for the benefit of others - that's what I want to know? His Majesty is one for certain, and I dare say that no one can dispute that. In fact, the past Kings of Thailand including His Majesty have given their lives for the betterment of the kingdom and people. 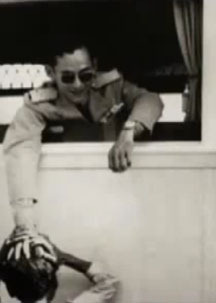 King Bhumibol Adulyadej has given more than others, as he has been on the throne longer. Simply saluting him, or lifting a hat off to him, or lifting a glass to cheer him is certainly never enough. I would prostrate before him, and "Tawai Bangkom" to His Majesty, as a Thai respecting his King, in the most traditional Thai way. It is an ancient Thai act of showing supreme respect to the king, kneeling down on the floor, with hands clasp together, raise above the head with the head and body bending slightly backward, and then back to the central position. The action is repeated 3 times altogether. One of His Majesty's many talents is as a composer. He is certainly an artist at heart, and his feelings have been recorded into these compositions. 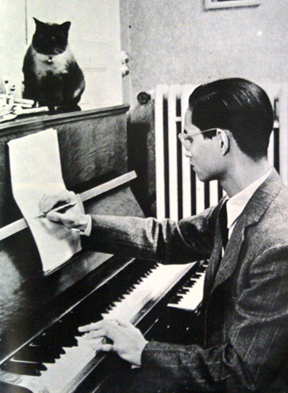 This photo shows a young king in formal clothing, at a simple piano, writing his composition. His Majesty's plump cat adds a common feel to the picture. It shows just a second in time, but sums up quite a lot. I would imagine this rare moment for the king one of his few happy times alone in his own world....a small luxury that His Majesty has not had for some time. I can still remember, when I was young, His Majesty would simply hop in a car and drove himself around Bangkok, with just one security vehical following him. The cars would go along Bangkok streets like any other. There was a story that one man, while stopped at a traffic light turned around and saw His Majesty at the wheel of his car. He was in shock and didn't know what to do, so he put his hands together and did a "wai" to His Majesty. The king acknowledged and smiled back. Those were simpler days, with no large entourages. His Majesty wanted to see his people, as well as the Bangkok traffic problems, which were already a big problem then, but cannot be compared to today. 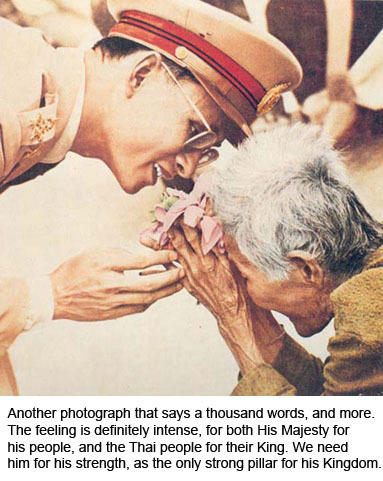 The picture at left conjures up a lot of memories when Thailand celebrated His Majesty's Diamond Jubilee in 2006. 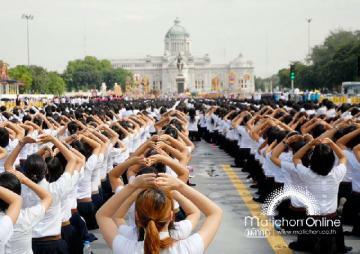 It was probably the last time to this day that the Thai people were in complete unity. The sea of yellow-shirted* Thai people flooded Rajdamnern Nok Avenue in front of the Anantasamakom Throne Hall, cheering "Long Live The King," not just one or twice, but so many times it felt like forever. It was intensed! His Majesty looked happy and healthy, though a little frail, but beaming all the while. It was another moment in time that the Thai people will remember for the rest of their lives. *Yellow was associated with just His Majesty as it is his birthday colour - yellow for Monday, before it was twisted to be used for political reasons just a few years later. 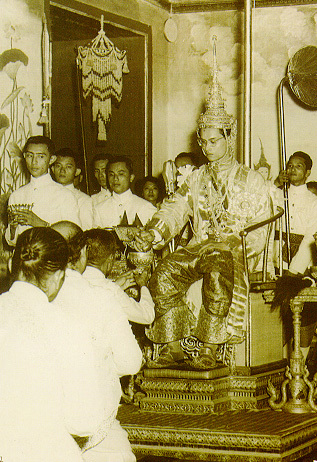 This last photo is of the day His Majesty officially ascended the Throne of Thailand, on 5 May 1950. This picture makes me proud to be a Thai, living in a land that has a good and righteous king as the single strong pillar for his people. It also reminds me that I live in a land that is steep in history, cuture and traditions, that is now, sadly, being looked over, and taken for granted in today's money-concious, Western influenced Thailand. 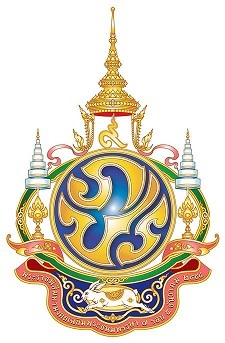 "We will reign with righteousness for the benefit and happiness of the Siamese people." It seems, the only certainty in this changing world. LONG LIVE HIS MAJESTY THE KING!